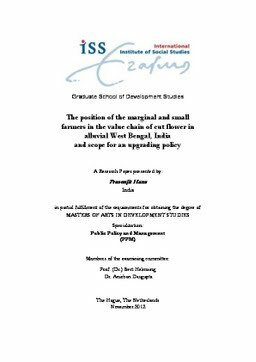 This study focussed on value chain analysis of cut flower chain examining rent, governance, systemic efficiency, smallholder problem and upgrading, in alluvial West Bengal, India. The purpose was to analyse the position of the marginal and small farmers of cut flower in the chain and assessing scope of upgrading policy. The physical area of focus was the central flower market of Mullick Ghat, the biggest in Eastern India, with three connected flower producing hubs. The areas were different in terms of having dominant auction, dominant spot market or without existence of any important physical market. Moreover, some beyond these four were under focus as part of chain. Semi-structured interview and observation were the main method of collection of field data. The study revealed existence of endogenous and exogenous rents in the form of human resource, relational, bounty of nature or proximity to Agriculture University. Chain governance came out to be arm’s length or ‘market’ in domestic local chain, between ‘market’ and ‘relational’ in long distance domestic and most of the exports and finally ‘relational’ in erstwhile export to The Netherlands. Considering delicate nature of fresh flowers, the major constraints to increase the money flow in the chain were found to be lack of efficient marketing, occasion-specific skewed price, low demand of high quality flowers, small holders’ problem providing little scope or opportunity, post-harvest and cool chain management among others. The dominance of arm’s length relation pre-empts scope of buyers’ support or opposition to upgrading and buyer-based substantial foreign or domestic investment. In upgrading policy, combined chain and cluster approach improving domestic and export market was highlighted with multi-pronged approach of local private investment, government support and inclusion in quasi-hierarchical global chain to raise income in dull season together with increasing market for high quality product.